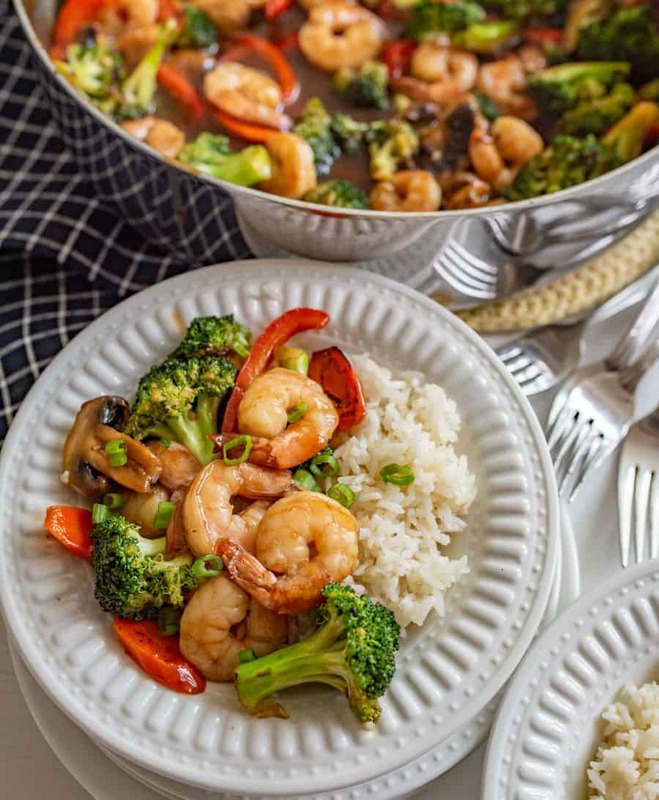 Quick easy and healthy shrimp stir fry that is made with lots of vegetables, shrimp, and a simple homemade sauce in 30 minutes or less. ‘Tis the season to set the cookies aside and eat a few more vegetables. I know that my body is certainly telling me it’s ready. 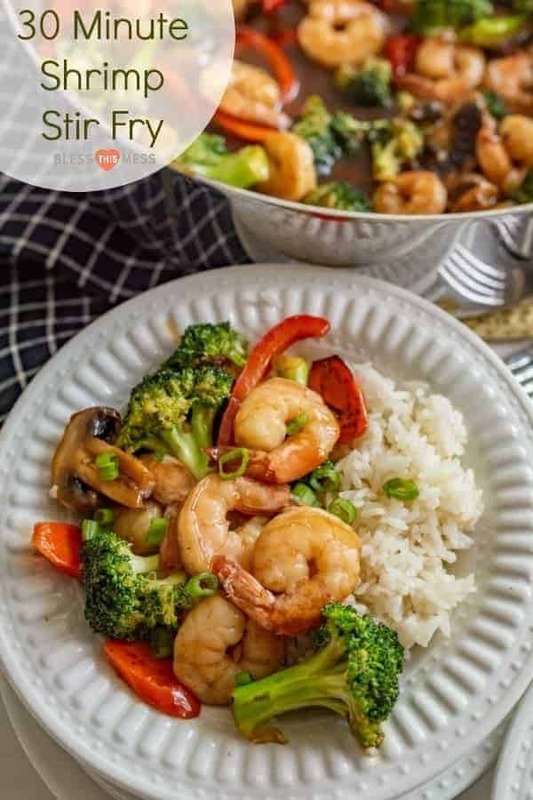 Stir fry is one of my favorite ways to add lots of vegetables into a meal and this shrimp stir fry recipe is one of my favorite go-to meals that I make often. 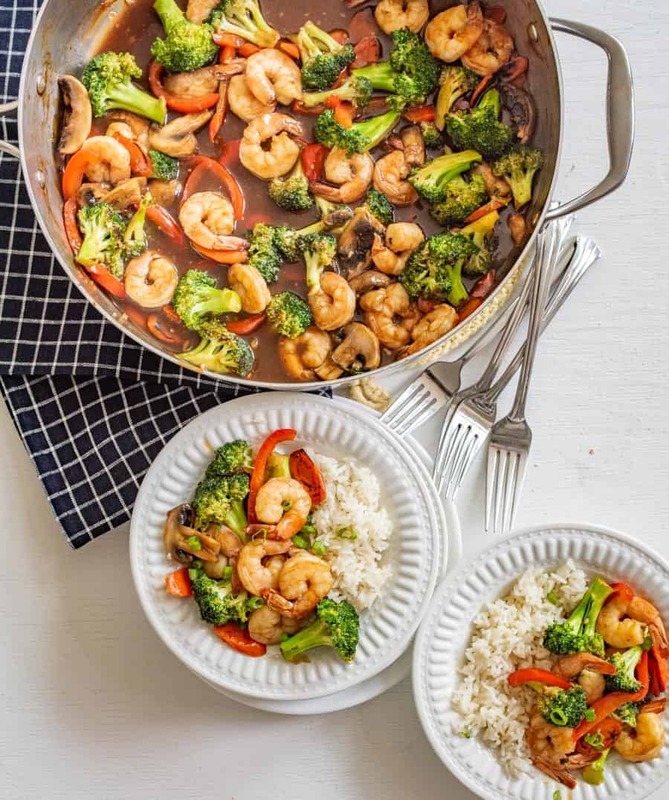 This stir fry recipe is made with all kinds of vegetables, a really simple sauce that only takes a few minutes to stir together (and you probably have everything on hand to make it already), and tons of shrimp which my kids are crazy about. Bonus: it only takes about 30 minutes to throw together! Take a look at my tips and tricks later in the post to get ideas on how to swap out the protein and how to mix up the veggies. That’s the great thing about this recipe – it works with just about whatever you have on hand. If your family loves broccoli, use lots of that. Not keen on bell peppers or mushrooms? Skip them or toss in something else in their place. Stir fry is not only a great option to get more vegetables in your diet, it’s an easy way to clean out the vegetable drawers when you have odds and ends left. This recipe is also gluten-free (if you use a gluten-free soy sauce). I love to keep gluten-free recipes on hand for when friends and family with gluten intolerance come over so that I have some good options to serve them. This is one of my favorites! Don’t love shrimp? You can use just about any protein that you like. Just season it well and cook it through before removing from the pan and then proceed with the recipe as directed. If you need this recipe to be gluten-free, just make sure you use a gluten-free soy sauce. Feel free to use any combination of veggies that you have on hand or are in season. You can also use frozen vegetables for this dish or stir fry frozen vegetable mixes, just heat through before adding your sauce and shrimp. Want to add a little heat to this dish? Try adding 1-3 tablespoons of Sriracha hot sauce to your sauce when you add all of the other sauce ingredients to a bowl. Do you wash shrimp before cooking? Rinse and defrost shrimp in cold water. Place shrimp in a colander, washing them thoroughly. How can I tell when shrimp is cooked? When properly cooked, the shrimp should be pink in color, and the flesh is slightly opaque. Shrimp cook quickly (2-3 minutes depending on size), and if you overcook them they will be tough. 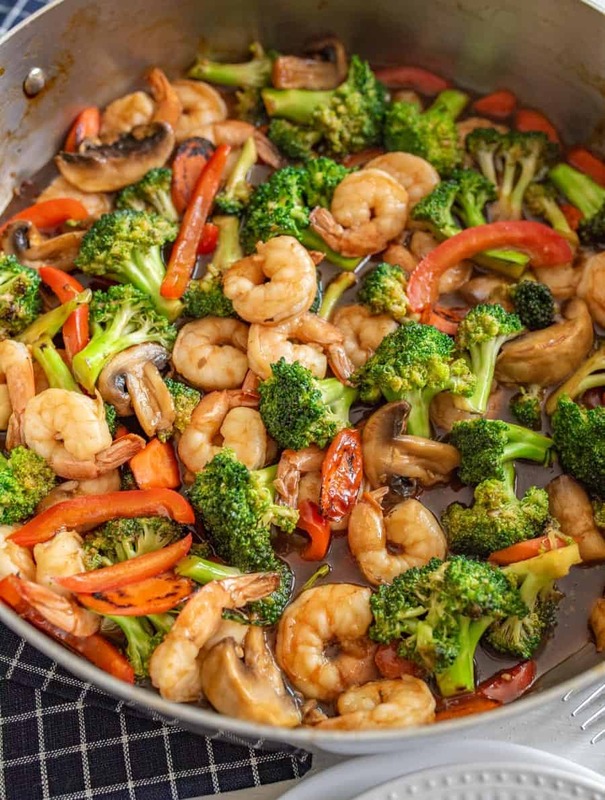 Quick and easy healthy shrimp stir fry that is made with lots of vegetables, shrimp, and a simple homemade sauce in 30 minutes or less. In a large skillet or wok, heat butter and half of the garlic over medium heat until the butter melts. Add the shrimp and cook until no longer translucent, stirring occasionally (3-5 minutes). Remove shrimp from the pan and set aside. In the same pan that you took the shrimp out of, add the olive oil and turn the heat up to medium high. Add all of your veggies. Put the lid on the pot so that the veggies can cook in their steam, stirring occasionally. While the vegetables cook, in a small bowl add the broth, soy sauce, honey, and vinegar. Gradually whisk in the corn starch so that it doesn’t get clumpy. Add the other half of the garlic to the sauce. After the veggies have cooked for about 5 minutes, add the sauce and allow it to simmer with the lid on until the veggies are just tender crisp and the sauce thickens, stirring often. Don’t overcook the vegetables. When the veggies are ready, throw in the shrimp and heat through. You can also use frozen vegetables for this dish or stir fry frozen vegetable mixes. Just heat through before adding your sauce and shrimp. 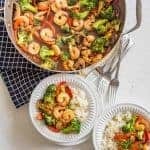 Hope you love this easy shrimp stir fry recipe and come back to it over and over again the way my family does. Thanks for stopping in and happy vegetable eating from my kitchen to yours. This post was originally published in March 2010 and has been updated, revised, and rephotographed in January 2019.